Last day of this blog anniversary week and what I will presenting today is a mash up with one my favourite chocolate brand. Several months ago I found this chocolate that I haven’t tried for more than a decade, I was so excited when I saw it I bought a big can for me to enjoy. That was a lot and after several days and half a can of chocolates I was wondering how would I finish all of them? Do I devour them bit by bit? If I do so I might so get used to it I might end up not liking it anymore so instead of doing that I used it as an ingredient. I was first thinking of cheesecake? But how would I represent the flavour of this chocolate in a cheesecake? How about an ice cream? Well I think chopped almonds will be a problem when it’s frozen. 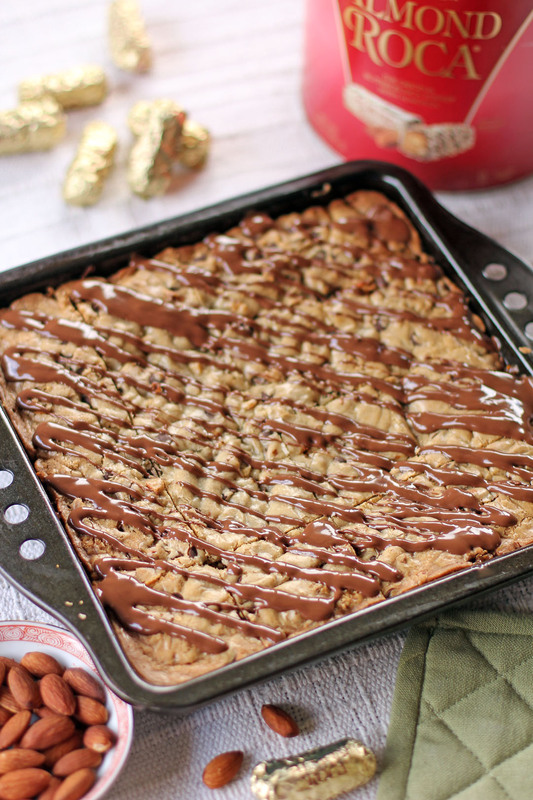 Cookie Bars, well this is the best idea that crossed my mind so be it. After patiently waiting for it to fully bake I was so anxious waiting and trying it out, once cooked I let it settle overnight in room temperature and its tasting time. The result 10/10, honestly this thing is amazing, it’s moist and chewy and not that sweet, I am glad to have made the decision to make it as a cookie bar. Combine melted butter, soft brown sugar, salt and vanilla. Using a hand mixer, mix it well until smooth in consistency. Add the eggs one at time while mixing at the lowest setting. Sift together baking powder, espresso powder and flour then combine it with the butter mixture. Continue to mix using the hand mixer but to not over work it. 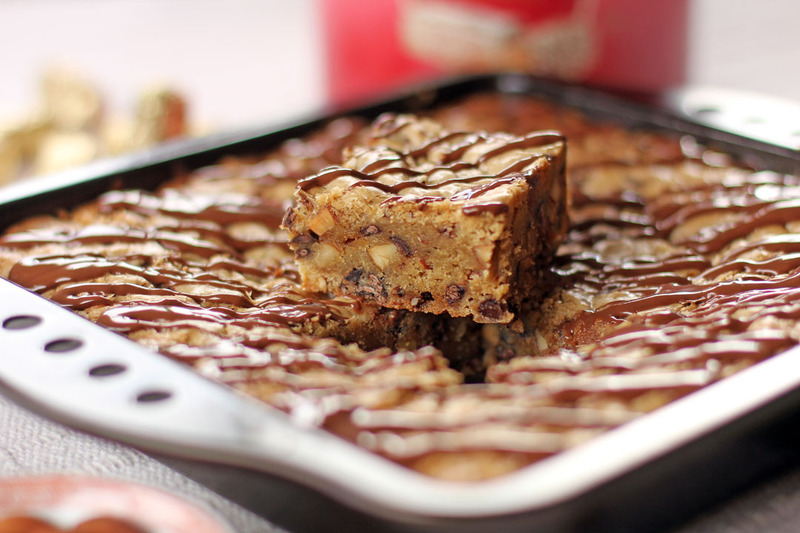 Once consistency is even fold in the almond Roca, chocolate chips and almonds. Pour mixture and spread in a greased 9 x 9 inch baking pan. Smoothen top with a wet spatula. Place in the oven then bake it in a 180C preheated oven for 30 to 32 minutes or until a toothpick inserted into the centre comes out clean. The centre needs to be wet that is totally fine this will continue to cook and harden. If you leave it longer it will dry out and will yield a not so chewy texture. Remove from oven then flatten it while still hot, the thickness should be even across the whole baked cookie bars, leave it overnight in room temperature before cutting then serve. I always love your recipes Raymund and I especially love the way you tackle those delicious sweets, because I always know there will be something unique about them. I love the density of this slice and though I’ve not tried these chocstes before, I most certainly want to now! My nieces totally gonna be crazy about if when i’m making this for them…. You will be so envious, Raymund, to know that not only did I grow up right near the candy manufacturer’s plant that produces this magnificent treat, the last place that Richard and I lived before moving here to Texas was also in that town and we lived directly next door to a lady who worked for Brown & Haley. Wahhhhh! You are killing me with jealousy. Oh my goodness, Almond Roca! This is my mom’s favorite and she buys a big jar/can of these when she comes to the US…. lol. She says it’s souvenior but I bet she’s eating them all! She’ll be so thrilled to see a dessert made with almond roca! I definitely want to try these bars. Then I would like to try the almond roca in dark chocolate ice cream.